Rockabill - Happy and Healthy (H.K.) (g. by Fastnet Rock). 2 wins at 1200m, 1650m to 2015-16 in Aust. and HK, HKJC Longines International Jockeys' Championship H., 3d HKJC Wong Shek H.
Moons of Jupiter (f. by Commands). Placed at 3 in 2014-15 in Aust. ROCKWOOD (Rock of Gibraltar). 4 wins from 1200m to 2000m, A$323,975, AJC Frank Packer P., Gr.3, Sydney City Toyota H., SAJC Betfair H., STC Epic Wright Heaton P., 2d MRC Toorak H., Gr.1, AJC Bill Ritchie H., Gr.3, Carbine Club H., L, STC Autumnracingcarnival.com.au H., 3d AJC Summer Cup, Gr.3, 4th MVRC Crystal Mile H., Gr.2, Newcastle JC Cameron H., Gr.3, MRC Lord S., L.
Miss Foxwood (Fastnet Rock). 3 wins at 1400m, 1600m, NZ$93,955, to 2014-15, ARC Barfoot & Thompson Twilight Cup, 2d ARC New Zealand Herald H., Waikato RC Hirepool 60 Years H., Print House H., Cambridge JC Harness Racing Waikato H., Marton JC Farmlands Iplex H., Te Aroha JC Towes Insurance Brokers H., 3d Waikato RC James & Annie Sarten Memorial S., Gr.3, Egmont RC Taranaki Breeders S., Gr.3, Manawatu RC Flying H., L, 4th New Zealand One Thousand Guineas, Gr.1, ARC Newmarket H., L.
Quartz Reef - Best Military (H.K.) (Redoute's Choice). 2 wins at 1200m, 1600m, 2d Manawatu Classic, Gr.3, BOP RC Tauranga Livestock H.
Le Moussier. 4 wins from 1600m to 2500m, Hawke's Bay Stead Construction Stayers H., Waikato RC Munns the Man's Store H., WRC Summer Cup, 2d Waikato RC Dunstan Feeds Qualifier, 3d ATC Wyong Rugby League Club H., Waikato RC Madisons of Cambridge H.
Foxspur - Speedy Winner (H.K.). 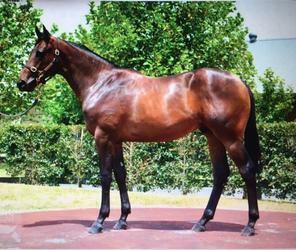 2 wins at 1400m to 2014-15, Waikato RC Warren Storm S., 3d ATC McGrath Estate Agents H.
Future King. 2 wins at 1000m, 1100m, ARC Hyland Race Colours H., 2d ARC Lindauer H., Waikato RC Suretrade Building Services H., 3d Waikato RC Risk Management Group 3YO H.
Full Count. 5 wins from 1400m to 2100m to 2015-16, Central Otago Summer P., CJC Majestic Horse Floats H., Waikato RC Centrepoint Apartments Caloundra H., 2d ARC Schweppes H., Waikato RC The Edge 97.8 Waikato H., Cambridge JC The Clubhouse Sports Bar H., 3d Otago RC Wanaka Cup, Peter Lyon Shearing H., Waikato RC Hamilton Cup Raceday H.
FOXWOOD (Centaine). 5 wins. See above. CELTIC TIGER - OPPOSING FORCE (Mal.) (Jetball). Malaysia Horse of the Year. 11 wins from 1400m to 2400m, A$8,490, 4,486,379Rgt. in Aust. and Malaysia, Perak Derby, L-3 times, Penang Sprint Trophy, L, Selangor Gold Cup, L, Selangor TC Piala Emas Sultan Selangor, L, Perak TC MRA Cup, SAJC Bar Chambers Distance H., 2d Perak Derby, L, Selangor Gold Cup, L, Penang Gold Cup, L, Selangor TC Tunku Gold Cup, L, Piala Emas Sultan Selangor, L-twice, 3d Selangor Gold Cup, L, Penang TC Yang di Pertua Negeri Gold Cup, L, Perak TC Coronation Cup, L-twice, Selangor TC Tunku Gold Cup, L, Penang TC Dr Lim Ah Soo Memorial Trophy, Perak TC MRA Cup, SAJC Kenton Valley Park Stud Starraq H., 4th Perak Derby, L, Penang TC Yang di Pertua Negeri Gold Cup, L.